Singer Amy Winehouse is set to turn model for her new clothing line - Fred Perry. 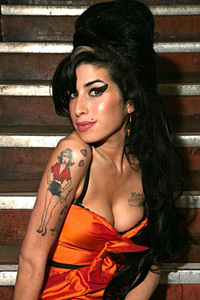 Winehouse has been working with executives at the label to produce her own range, which includes coats, shirts and skirts. She will herself model the designs in the November issue of Britain's Glamour magazine. "The collection I've done is so classic because their style and my style are pretty much the same. Fred Perry is my be all and end all. I've always loved it, always worn it, and it feels like a living dream. I'm not an overconfident person, but I'm really sure about this collection," contactmusic.com quoted her as saying. The singer focused on clothes designing after her ex-husband Blake Fielder-Civil was sent to prison in 2008 for grievous bodily harm and perverting the course of justice. "I went through a lot of trouble with my ex-husband, so I had such a long time to think about the collection," she said.